Nebraska company now offering new aluminum boxes in its product mix. Brehmer Manufacturing, Lyons, Neb., is already known for steel silage and grain boxes. Now, Brehmer has added an aluminum silage box to its lineup. 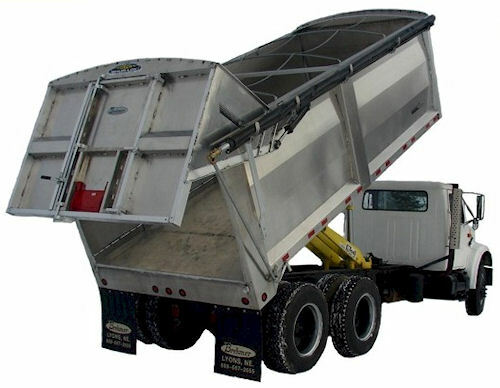 It features 8-inch aluminum channel long sills, 4-inch aluminum channel crossmembers, gusset reinforcement of all crossmembers, a tapered body 3 inches wider in the back than in the front, 3/16-inch smooth aluminum plate floor, 1/8-inch smooth interior aluminum sidewall, hydraulic end gate with one grain trap. Brehmer offers lighter tare weight aluminum silage box in its long list of hauling beds. The standard box is 96 inches wide with a 60-inch side height. Boxes are available in 16 or 24-foot lengths. Options include extension pockets, a 102-inch wide body, air cam lock, cargo door, extra grain traps, lights in the bumper and steel extensions in mesh or solid. For more information visit www.brehmer.com, or call (888) 687-2655.